When I hand you the king piece from a chessboard and say: ‘This is the king’, the word ‘king’ means nothing to you unless you already know the role of the king in chess. In fact, we can easily imagine someone learning to play chess without ever having seen an actual king piece. So the shape of a chess piece corresponds here to the sound or shape of a word. Grasping the meaning of “Revenue Assurance” is a lot like a novice chess player learning the role of a chess piece — just more elusive. Of all the functions of a telecom business, RA is perhaps the hardest to define because the term is used in so many different senses — many of them having nothing to do with directly assuring revenue. Do you mean aligning provisioning with the bill? Ensuring a service is profitable? Settling the right amount with a trading partner? Taming fraud and inefficiency? Assuring the quality of the customer experience? All these things can rightfully fall inside the revenue assurance game. It depends on how you define it. Better yet, it depends on how RA experts currently practice their profession — and add value in a telecom business that constantly changes its services and shifts its business models. 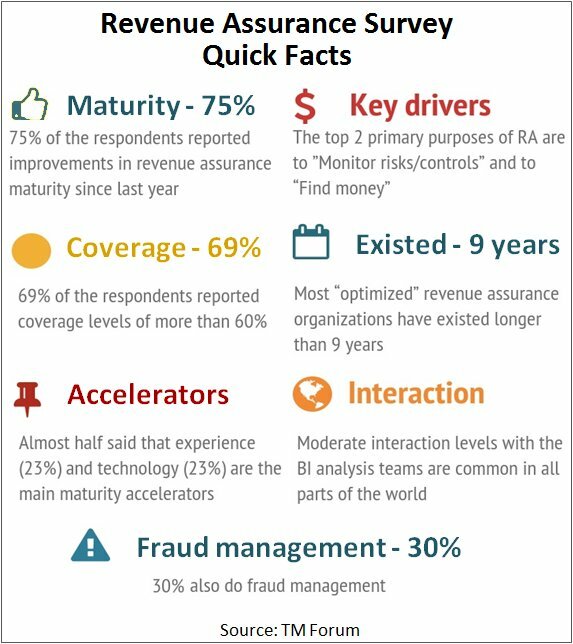 What better way, then, to learn the current meaning of “revenue assurance” than to contact those RA experts and survey them about their activities, successes, failures, and future directions. In fact, the catalyst for this column is a survey of 122 revenue assurance experts and managers conducted by the TM Forum that you are free to download and read. And here to provide some perspective on revenue assurance trends are two organizers and supporters of the survey, Rene Felber, who is heading Revenue Assurance at TeliaSonera Finland and Gadi Solotorevsky, CTO at cVidya. Dan Baker: Gadi, you and your firm cVidya, have supported the TM Forum’s RA community for many years, so congratulations on the success of this survey. I’m wondering if you noticed any particular surprises in the survey results compared to previous years? Gadi Solotorevsky: Thank you, Dan, we are also gratified by the participation level, but the credit goes to Rene who started the campaign to get people to participate, using a colleague-get-a-colleague approach. As far as the survey results, there are really no big surprises compared to previous years. From my point of view, we continue to see Revenue Assurance evolve and become more mature. And this is also the opinion of the survey participants — most believe their revenue assurance programs are improving and expanding. And yet I still don’t see revenue assurance practitioners eager to try to protect the new revenue streams. They have very good control of traditional revenue streams, but I think telcos must realize that new revenue streams like mobile money, OTT, and IoT will become an important part of their revenues, so they need to protect these new revenue streams. But big telcos see an opportunity and are investing in these kinds of services. And so we need to know how to protect this type of service even if the kind of assurance we provide is different. For instance, protection might entail making sure the technician doesn’t go too many times to the house to fix something. It’s not just ensuring the configuration of the switch. Let’s delve a little deeper into IoT if we could. I believe IoT is going to be big, but I question how much direct revenue telecoms will extract from the IoT, even though communications is the big enabler of it all. GS: The Internet of Things can mean many things. Sure, there are many cases where only a low level of connectivity is required. But what about connected cars where there’s a SIM in the car and everything in the car is controlled using apps — whether it’s getting music or controlling the air conditioning? Companies like Verizon and AT&T have started to offer these kinds of services. Now the question is: how do you manage it? It’s quite different from your regular phone. And in some cases you will get the service from one of the big operators, but the connected car capability will be sold to you by the car manufacturer. So there’s a multi-player ecosystem and some complex processes are involved. And yes, today it’s a very small part of revenue, but this is the kind of scenario we will see more and more, so telecoms need to get good at assuring those services. Rene Felber: How telecoms position themselves in IoT is key. It involves working proactively with new business partners, vendors — even cooperating with competitors. For sure, telcos who wait on the sidelines for IoT to arrive are not going to make much money there. What’s especially interesting to me is that data will become an integrated part of many future communications services. This will create new challenges on fast-developing customer expectations and on data privacy. For example, I’m a passionate runner and I’ve been dreaming about one day having a virtual running mate who helps me manage my energy levels, optimize my fitness, and compete in running contests with other virtual or real runners. So to make this happen, sensors (in wearables or even inside my body) would constantly measure my pulse, lactate and energy level, then give me advice about how to smartly manage my power resources. The sensors would collect real-time data on my body and process it real-time. That analytics will, in turn, be relayed back to me and maybe recommend that given my current energy resources, now would be a good time to initiate an attack. Maybe an idea like that would be dismissed as science fiction a few years ago. But today wearable devices like FitBit and the Apple iWatch are big hits, so suddenly it doesn’t sound crazy anymore. So in advanced IoT applications, you’re bound to have advanced support services and data in play. And those apps will need to be tested, optimized and secured if people are paying for those services. So IoT will certainly make things simpler in some ways, but more complicated in others, especially when you are delivering a service together with partners trying to optimize your revenues and profits and at the the same time trying to keep pace with user’s fast growing expectations. Looking at the survey data, most respondents felt that the maturity of their RA organizations is high. And yet something like 20% said provisioning is still an issue. So that struck me as odd because getting provisioning right is basic to RA. GS: Provisioning itself is going in some interesting directions. Consider mobile data. Customers are increasingly able to manage their own security features when they go abroad. And perhaps they put some limits on their usage. Then there’s also the option of buying high speed data packages. All that functionality needs to be managed and so the provisioning element is becoming more sophisticated. Think about a SIM inside a connected car. Now until the SIM is activated, you can’t charge for its use. We need to charge for the SIM only after the car is sold to the end customer, and knowing when that happens is a tricky process in itself. So this is a real world problem: provisioning is not so simple anymore because some additional factors need to be considered before something is activated. RF: My feeling is most revenue assurance teams are controlling traditional provisioning quite well. But when it comes to provisioning of increasingly sophisticated customer offerings, there are still gaps. For a simple home broadband connection, you need to know about local infrastructure to verify available speeds. You also need to coordinate with delivery on how and when to install the right equipment and to activate the services as agreed with the customer. To avoid broken promises, provisioning and billing need to be in sync with customer-specific agreements. And that shows how we need to think about how the whole process — even the order-to-invoice part — plays into revenue assurance. At my company, that’s what we are trying to do — take the whole order-to-cash process and try to streamline and revenue assure it. I’m curious how the daily activities of a revenue assurance professional may have changed in the last few years. How has the role changed in light of new software capabilities and new missions? What’s your take, Rene? For me, walking around means visiting the folks in the commercial department or those creating the offering. (Luckily for me, those guys work within walking distance.) But we need to continually check what’s in the pipeline, so we can understand the risks related to change, so you can ensure you are capturing revenues from day one. Also we see an increasing need for visibility in product and customer profitability. It’s getting important for us to understand credit control — not only as a financial control — but also as an instrument to optimize sales and profitability. We are less concerned with the revenue this time: profitability has actually become more important. GS: Dan, it’s a thought-provoking question because it made me ask: what was a good revenue assurance person 7 or 8 years ago? And what would I consider the typical job of a revenue assurance person today? Seven or eight years ago, a revenue assurance professional should have very strong IT skills: an ability to pull data from here and there, and start to build queries. That emphasis was appropriate back then. And of course, they needed a little bit of business orientation to be able to ask: Ok, how does such and such problem impact the business. However today I think it’s quite the opposite. The tools that you have and the support in the organization permits you to put the IT skills — though still important — to the side. You can now have very good revenue assurance pros who come from the business side, and with some tools, they are capable of doing some interesting things. But seven or eight years ago, the guy from the business side would have a much tougher task getting the job done. Rene, are you seeing something like that? RF: Yes, that certainly is my experience. In the past, it was the IT organization who took care of the revenue streams. But that’s changing. For instance, in the TM Forum survey, more than 70% of the people who responded are located in the finance department. I guess the bigger question is: where is it going? My hunch is we’ll see a shift towards product management because the commercial organization has an incentive to understand processes end-to-end (order to network to cash) creating products and offerings that create real money while understanding and keeping customers. And it’s a bit of a bartering game. Who owns the business? Well, that’s probably the commercial organization that definitely needs support from finance, IT and operations to get Revenue Assurance right. So whoever is driving the business, these are the folks who define the agenda and influence what skill sets that are on the revenue assurance team. Rene, where would you like to see the RA software vendors focus their R&D energy? RF: A lot of vendors have tried to put the old style revenue assurance together with control management and help the C-Level guys decrease bad debt. And by “old style revenue assurance” I mean detecting something that’s already happened — or it could be reporting fraud cases and leakages. The old style RA is useful, but I personally would like to see the software guys help me monitor my revenue streams more dynamically and help me achieve my profitability goals. But if you are monitoring revenue streams and profitability on top of it, it’s a bit of a challenge to devise KPIs for those areas and figure out what to monitor, because you need to have a really good end-to-end process understanding. To succeed, you need to embed RA technology well in your own data warehouse environment where data is available for multi-purpose real-time analytics. So I think there is plenty of space for software vendors to deliver business value. Thank you, Rene and Gadi. Between the survey itself, and this follow-on conversation, I think you’ve energized the RA community to think about where it can continue delivering value in a business that never stops morphing into something new. Rene is leading TM Forum’s global Revenue Assurance (RA) survey since 2014, having transformed it into an insight-based collaborative experience. Dr. Gadi Solotorevsky is the CTO of cVidya Networks and a has years of experience developing and deploying Revenue Analytics solutions and methodologies. He is one of the founders and the chair of the Revenue Assurance team of the TM Forum, and leads the development of the Analytics Big Data Repository (ABDR) concept. He is also a TM Forum Distinguished Fellow and Ambassador.